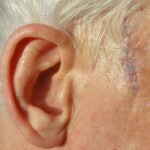 Abstract: This is the personal account of a 70 year old man who underwent micrographic surgery for an ill-defined basal cell skin cancer on his temple. It is intended to inform patients and physicians about the personal experiences and perceptions of Mohs patients. A micrographic surgeon has added a coda. 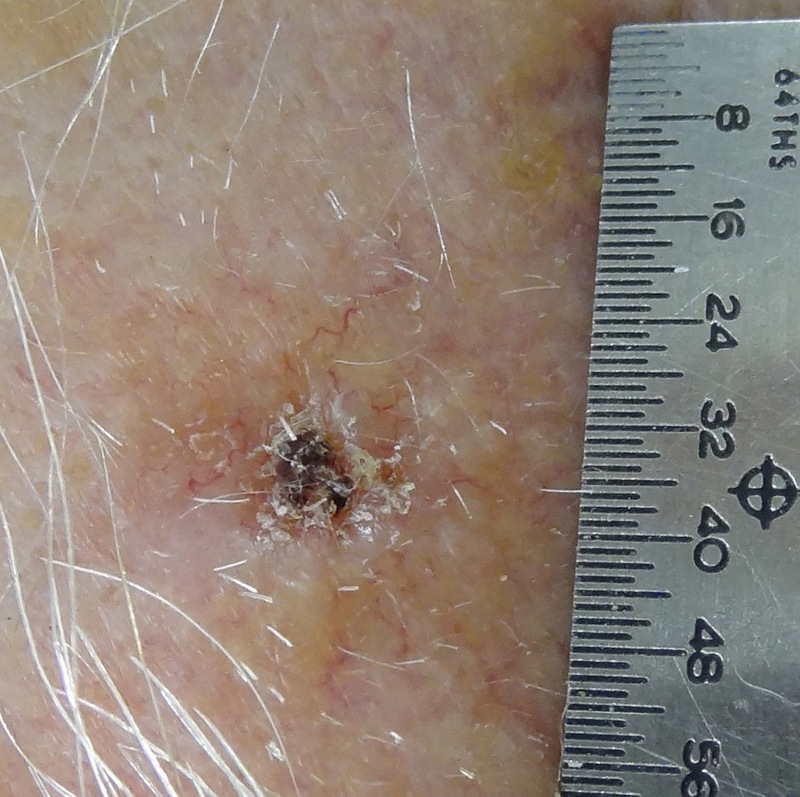 Introduction: Dermatologists see patients with nonmelanoma skin cancer on a daily basis. 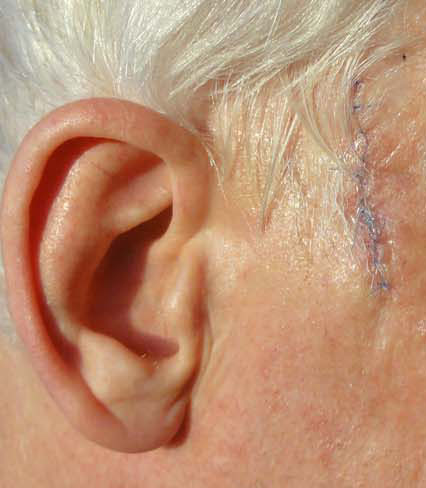 Certain tumors, especially those around the nose, ears, and eyes are best handled with micrographic surgery (aka, Mohs Surgery, Mohs micrographic surgery. MMS). 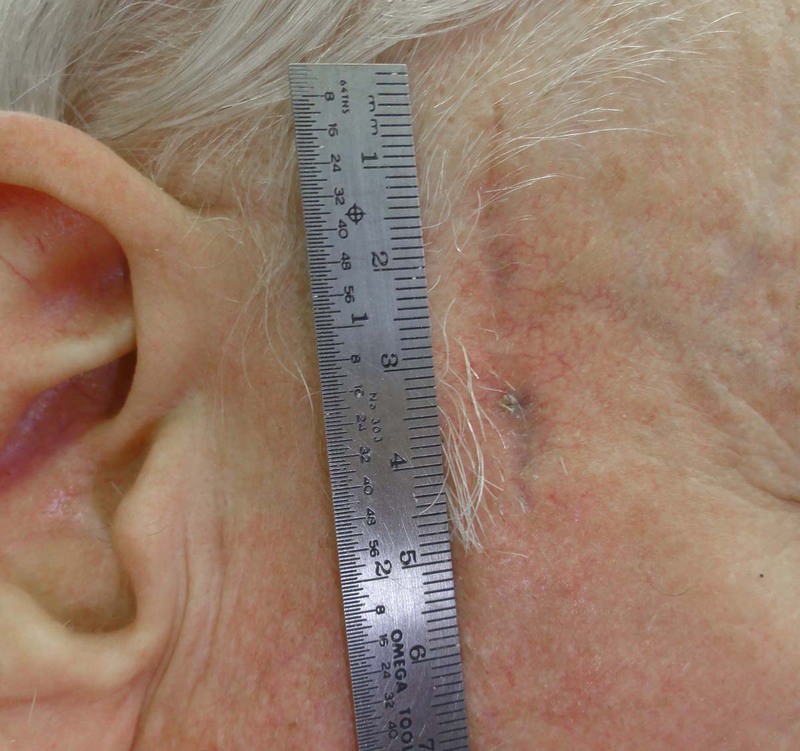 While some plastic surgeons claim they do a form of “modified MMS,” the procedure they do is significantly different and in our opinion is not suited to tumors in certain sites (nose, around the ears, eyelids). The following essay is the account of a 70 year-old man who underwent MMS for an ill-defined micronodular basal cell of the right temple. I assume my Mohs experience can be quite different from that of others depending on the location of the lesion. My lesion was located on my right temple and I can say the procedure was easier in some ways than going to the dentist for a filling. While laying on my side with my head on a pillow, a swab of antiseptic and an injection of anesthetic around the lesion area was all that was needed and even that was less painful than an anesthetic injection in the gums. The physician and attendants were cheerful and friendly and during the procedure we carried on a short conversation about where we lived, travel etc. which is something one cannot do under the dentist’s drill. After only about one minute the first skin sample was ready for the lab and the affected area was being cauterized. The cauterization doesn’t smell that great but it is a familiar odor I often detect when some stray hairs get sucked through my hair dryer. Cauterization (a little prickly) took about thirty seconds. 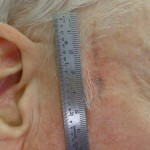 Then a photograph was taken before the assistant applied a temporary dressing. I think the temporary gauze dressing and paper tape took a little longer to apply than the operation itself but we talked about triple pane windows as opposed to the new double panes having the insulating coatings. Then I could sit up and stretch while my wife was called in to see how I was doing and to stay with me while we waited the result from the lab. At this point, if you are familiar with the Mohs process, you know that you need to wait while the lab analyzes your specimen. I was of two thoughts at this point. One thought was hoping to hear that they had gotten everything and that I was cancer-free while an opposing thought was that if they got everything the first time, perhaps they removed much more than they needed to. The assistant said that the average was three samples per person. About thirty minutes later the result was back and some more trimming was needed, so my wife left the room and the same process was repeated. About fifteen minutes later she was back and we were waiting again. And again the lab report indicated a third sample would be necessary. When my wife came back after the third sample left for the lab, we watched some Internet videos on her laptop which helped to pass the time. The third lab result was cancer-free which was a great relief. After some question and answer time concerning the size and location of the scar, it was time to close the wound. A little more Lidocaine anesthetic was administered and my physician began stitching me up as she spoke of her nice visit out to my local dermatologist. Earlier that morning my wife and I had gotten up at 3:30 AM to make the fairly long drive out to the hospital from our home to arrive for an 8:00 registration. Now, at 12:30, we were back in our car having some snacks beside our bag of wound care instructions and materials. My wife had been expecting to drive me home but I felt normal and could get my glasses on over the dressing although a bit tight. So I did the drive home which included an ice cream cone treat on the way. Post-Op Care: Sleep with head raised, keep dressing dry and in place for 48 hours, no heavy lifting or exercise for a week, apply medications and replace dressing once a day. Forty eight hours later the dressing removed easily in the warm shower. I had eleven stitches, the wound looked infection free and there was very little pain. My wife applied a new dressing according to instructions and used the gauze and tape supplied in our wound care kit. Twenty four hours later I removed the second dressing in the shower but this time the adhesive separated from the tape and remained a waterproof sticky mess on my skin and hair. We compared the kit tape we had been given with the original dressing tape applied at the hospital and saw that it was different. We then spent a long time with q-tips and a citrus-based goo cleaner removing the mess. I’ve learned from other type goo troubles that lacquer thinner cuts goo best but that solution didn’t seem safe in this situation. We then switched from the taped gauze dressing to a large band-aid that was cut with scissors to better fit the wound shape. This band-aid solution has been working fine as it removes easily and cleanly in a warm shower without a lot of skin and hair pulling. A week after the surgery my local dermatologist removed the stitches and now nearly two weeks after that I’ve been hiking with my friends and cutting trees with my chainsaw. The wound is band-aid free, pain-free and healing well. This entry was posted in Anonymous and tagged basal cell carcinoma, illness narrative, micrographic surgery, MMS, Mohs micrographic surgery, Mohs surgery, nonmelanoma skincancer, squamous cell carcinoma by humanemedicine. Bookmark the permalink.